This Saturday night live on Showtime, Adrien Broner meets Mikey Garcia in the main event from the Barclays Center in Brooklyn, New York. Even without a title on the line the stakes remain high based off the accomplishments of both men. Showtime will also be live-streaming the undercard via Facebook & Youtube, 3 fights in total including unbeaten heavyweight Jarrell ‘Big Baby’ Miller versus one-loss Gerald Washington. 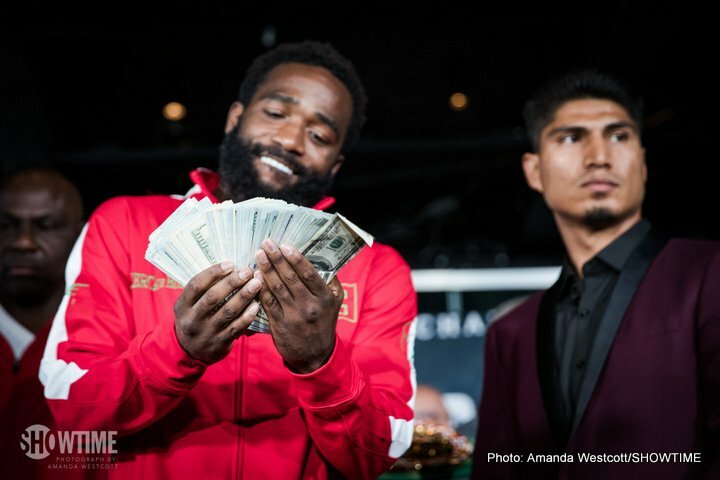 Let’s start at the top of the bill with a very intriguing matchup between Mikey Garcia 36-0, (30KO’s) and Adrien Broner, who hasn’t lost a fight under the welterweight limit. In fact the weight of 140 pounds is a good item to focus on for two main reasons. One, Broner has failed to make the junior welterweight limit in almost two years. October of 2015 is the last time Adrien made the weight when he fought Khabib Allakhverdiev for a vacant WBA belt, which he was promptly stripped of after failing to make 140 pounds in his first defense. The other point about the weight is Garcia venturing up to a place he’s never been and how that affects him. Can Mikey respond well to the punches & does he bring his power with him to 140. These questions will be answered come Saturday. For now let’s focus on what we do know about Broner and Garcia. It’s crystal clear why Mikey is so talented and much of it has to do with upbringing. The Garcia family of trainers and boxers in the hurt business runs deep. Garcia is gifted technically he likes to take his time but generally is worth the wait once he measures the opponent. For years a small percentage of fans would complain about Garcia’s tactical approach. I myself would tell my friends to be patient for the first part and per usual the knockout would come. The only negative about Mikey is his lack of true love for the game having stumbled in to the sport as a youngster. The recent break due to a contract dispute has supposedly reignited Garcia’s hunger but only time will tell. Garcia isn’t the most-flashy of fighters one could say maybe even a touch flat-footed. But his fluidity when punching and a thump heard when he hits the target, is all you need to see and hear to know he’s got the goods. Once he finds his range the crisp and hard shots begin to take their toll. Broner on the other hand is the definition of flash and flamboyant. The boxing world is left scratching their heads with Broner’s inconsistency outside the ring that greatly affects his ability to show true potential. Climbing up the ladder at 130 & 135, Broner looked the part of a lightning-quick, dangerous puncher. The folks that looked a little deeper to Broner’s fights versus Fernando Quintero as a prospect on ESPN and Daniel Ponce De Leon on HBO saw an overrated guy. Although it’s literally hard to write this, it does seem as though Adrien took this camp very serious, having already fought in February and using the month of May to slim down before training camp. It appears the best Broner possible, at this stage anyway, is ready to put on a show. That’s the thing, whether you love or hate the guy, when in shape he does provide entertainment win or lose. The most popular opinion going around boxing circles is Mikey Garcia will knockout ‘The Problem’. Almost unbelievable, Broner opened as a sizable underdog and still stands around 3-1. It’s not that I don’t think a KO is possible, for me it’s how nonchalant it’s being thrown as a given. If (A big freaking if) Broner is in tip-top shape as advertised this will be a competitive fight. If that two-way action doesn’t translate on the scorecards it will within the rounds making Mikey really earn this one. It’s interesting because neither man starts fast out of the gates, most of the time Broner loses a few rounds as he walks to his opposition in effort to close the gap. Once close enough his precise combination punching is a thing of beauty. Adrien has a great jab and left hook but when he’s really on his ‘A’ game the body work displayed is impressive. One wonders if Broner will try to outmuscle Mikey and muck it up on the inside as a bully. Walking blindly to Garcia is silly but behind an active jab and scoring combos for this scribe it’s the only way to go for victory. Normally it is suicide to come right at Mikey but Broner fights that way and has a solid chin. Plus, a scenario placing Broner on the move or in the middle of the ring skill for skill is unlikely to play out any better. Orlando Salido loves to push-forward making for a rough and tumble affair. Salido was hit about as flush as it gets repeatedly by Mikey. However, Broner is much faster and even bigger then Salido the real questions is how deep is Broner willing to dig. Broner will win some early rounds based off hand speed and accuracy. It will take a fair amount of time for Mikey to adjust to the fastest boxer he will of face by far. After the early frames, look for Garcia to time Broner’s jab. At first it will be over the top with his jab and when Garcia is finally comfortable, his vicious straight right hand will follow. Mikey will create enough space to land the bigger and better punches in the second half. But it won’t come without a few touch and go moments. Garcia’s chin will past the early test as will his inside fighting skills he rarely shows. Mikey will circle Broner and use subtle movement, possibly a steady diet of lateral movement early to make Broner reset his offense. Mikey will win in decisive fashion but will have to really work to get to the finish line. My Official Prediction is Mikey Garcia by Majority Decision. Side Note: Keep an eye out for what should be a pretty fun heavyweight matchup between Jarrell Miller and Gerald Washington. Showtime will stream this one and two other fights on Saturday via Facebook and Youtube. Washington has a great jab but is it powerful enough to keep Miller off of him? Early success from Washington’s jab will lead to plenty of exchanges as ‘Big Baby’ slowly but surely wears him down with pressure. My Official Prediction is Jarrell ‘Big Baby’ Miller by late stoppage.